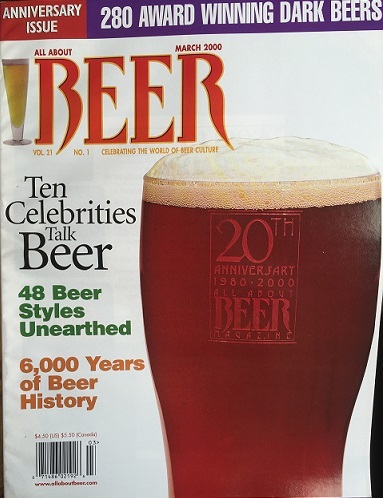 In our March 2015 issue, we chronicled All About Beer Magazine‘s 35-year history in an article entitled, “35 Years Devoted to the Curious Drinker.” Pictured below are the magazine covers and captions that ran alongside that article. Thank you for the collection of memories brought back by these AAB covers. The Good Beer Movement is now about a half century old, and what a time it’s been! By the way, if you still see Daniel Bradford, give him my best. Where is the 20th Anniversary edition cover? I did the etching on the glass for that cover. Remember..had to look hi and lo for a blank glass after the first etched glass you got from Things Remembered was a dud. I don’t think we have a digital version of that cover, but I’ll see if I can at the very least snap a photo of it for you. Hey Jud, here it is!